1) Once you've logged in to your Shopify dashboard, navigate to 'Products', then to 'Product List'. 2) To pick out specific items to export, use the 'Filter Products' dropdown or the search bar. 3) Once you've filtered your products, you can choose the specific items you'd like to export. 4) Shopify will send you an email with your .CSV inventory file. 5) Open the .CSV file. 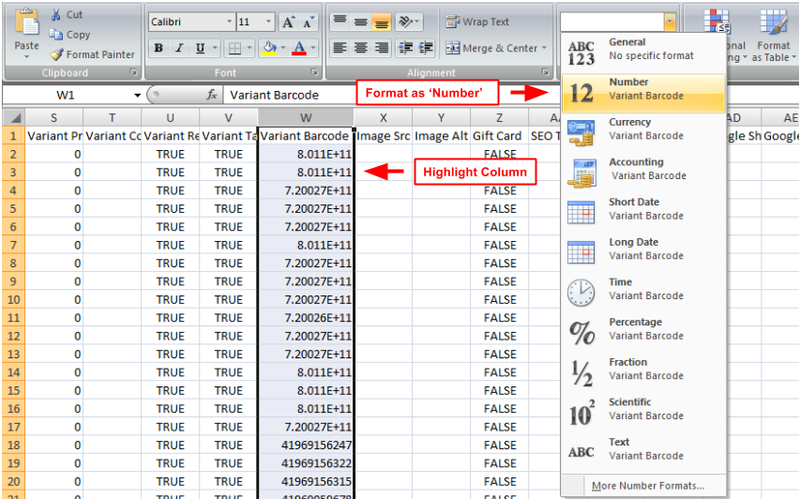 Highlight the entire 'Variant Barcode' column and format as 'Number'. 6) Delete all rows containing items you would like to exclude from your upload to BoxFox. You can also update quantities in the remaining rows, if you would like to include some, but not all, of your inventory counts of a specific item. 7) For BoxFox to properly recognize your items, you need to include UPC, title, quantity, and size (if applicable). Fields like brand, price, and cost are helpful as well. You can delete other columns from your spreadsheet that don't apply. Please make sure the UPC's you export are from the manufacturer (not your own store codes). If you have product images associated with your items, you can use the links within the 'Image Src' column. BoxFox will automatically pull the product images associated with those links for viewing by our network of buyers. 9) You can save your inventory list as a .CSV or Excel file. Before you do, please make sure your UPC's display properly within the spreadsheet. To help format your inventory data for BoxFox, you can download a template spreadsheet here. You can also access FAQ's for selling inventory on BoxFox.